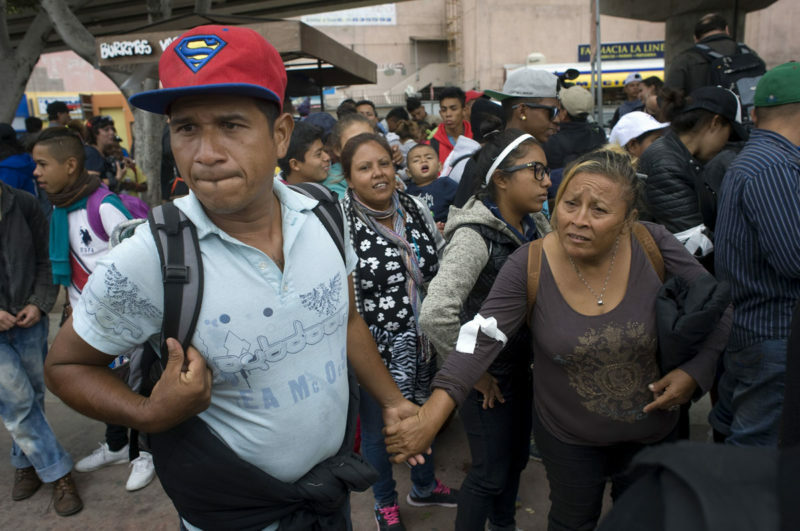 People in a caravan of Central American migrants walk to the U.S.-Mexico border crossing where they will present themselves to U.S. immigration and seek asylum. It’s an unfortunate truism that the most devastating tragedies and events often produce brilliant journalism. This week, as outrage and chaos erupted over the Trump administration’s separation of families at the border, one thing that struck me was the journalistic efforts that have stood out the most were not what you might expect. Yes, there were crucial news stories about policy changes and press conferences, and there were also tremendous investigative stories uncovering important details, for example, about the facilities housing migrant children. Yet the most provocative pieces of journalism that shed light on the crisis at the border haven’t been stories at all. ProPublica published haunting audio from inside a Border Patrol facility where young children were being taken from their parents. The audio is horrifying. And it was a game-changer. Finally, design – another important corner of journalism that rarely gets much public consideration – went under the microscope when Time magazine revealed its latest cover: a compilation of two images, the crying Honduran toddler, and a smirking Trump towering over her. Many hailed it as provocative, but it was also criticized as exploitative. Each of those pieces adds a new element to the family separation issue that had been missing – a face, a voice, or an image that makes you see things in a way you hadn’t before. I’m in the business of producing stories, but it was invigorating to see each of these non-story acts of journalism rearrange the public’s understanding of this crisis. We’ve been doing our best to help make sense of the chaos regarding zero tolerance at the border, including an FAQ this week on family separations and what’s happening here in San Diego. Former border czar Alan Bersin weighed in on the latest episode of the podcast with ideas about what policies could help alleviate the crisis. One man who’ll be stepping into the center of the storm is Bob Brewer, Trump’s pick for U.S. attorney in San Diego – here’s a bit about his background. As all this is unfolding, Mexico is in the midst of its own presidential election. Perhaps you’ve heard about it on your radio. SANDAG is hoping to solve the problem of bus drivers idling in downtown San Diego, forced to take restroom breaks at porta-potties on sidewalks. It wants to build a stopover bus facility on a lot downtown. While it’s at it, it figures it might as well build a new headquarters there too – but it might have to seize private property to do it. The possibility is still alive after SANDAG’s meeting Friday. Maureen Stapleton, the longtime head of the San Diego County Water Authority, has helped the region secure its own water supplies – a major accomplishment. But in the process, she’s stoked a water war that’s been rife with bitter and personal attacks. When Kristen Murphy read Ashly McGlone’s story on a teacher who had a sexual relationship with a 17-year-old student, she saw some eerie similarities. Murphy says she had a relationship with the same teacher – and even though it began when she was legally an adult, she believes he crossed emotional boundaries when she was still a minor and a student to groom her for an eventual physical relationship. “It’s insulting to say that I spent $30,000 (a month) on wine,” says Depp. “Because it was far more.” – This profile of Johnny Depp and his extraordinary money problems is soooooooo entertaining.